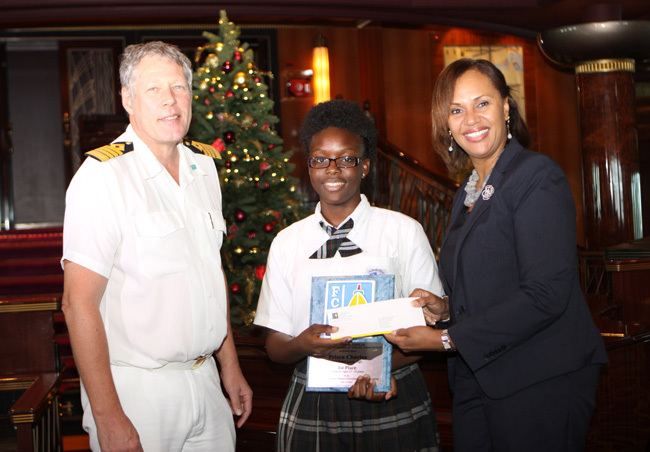 NASSAU, The Bahamas – The Ministry of Tourism has congratulated Prisca Charles, an 11th grade student of C. V. Bethel Senior High School for winning the Florida-Caribbean Cruise Association 2014 Children’s Environmental Poster Competition, beating out thousands of other students in the region. 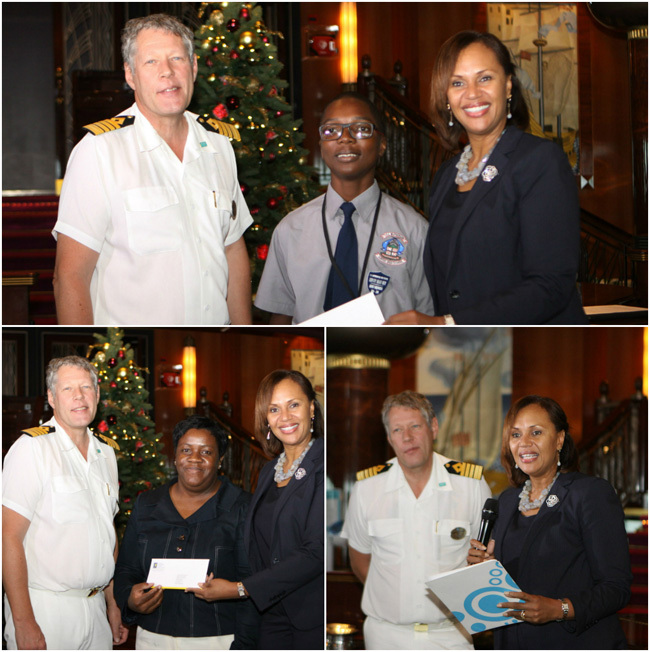 A special ceremony and luncheon was held Wednesday, November 19, 2014 on board the Norwegian Cruise Liner, Norwegian Gem, a member of the FCCA. There, the 16-year-old winner was presented with a plaque and funds for her outstanding accomplishment. The 15-member cruise lines association holds its annual FCCA Foundation Children’s Environmental Poster Competition to promote and encourage environmental awareness among students and “to effectively educate the younger generations on the importance of environmental protection,” it says. Director General of Tourism Joy Jibrilu congratulated Prisca Charles on her win and Rodney Farquharson, a student of S. C. McPherson Junior High School for his outstanding participation in the competition in the Junior Category. “This year’s theme, I am told, seeks to promote environmental awareness among Caribbean students, while educating our younger generation on the importance of environmental protection,” Mrs. Jibrilu said. The Ministry of Tourism wholeheartedly supports these ideals, she continued, as they embody its vision and overall objectives, in its quest to promote environmental protection for future generations. “The partnership between The Bahamas and the Florida Caribbean Cruise Association continues to augurs well for the sustainability of the tourism product. We are delighted for the accomplishment that was achieved by Prisca during this year’s Poster Competition,” she said. Mrs. Jibrilu thanked the FCCA, Captain Stefan Nordberg and crew of the Norwegian Gem for the kind hospitality in hosting the ceremony and luncheon on board the cruise ship. “A special thank you is also extended to the principals and teachers of both C. V. Bethel and S. C. McPherson schools for their commitment and dedication in ensuring that our young people are prepared to compete in this competition annually,” she said. She also recognized the Minister of Education, Science and Technology for the “invaluable service” they render each year in ensuring that the information is disseminated to all of the private and public schools throughout The Bahamas and for judging the preliminary part of the competition. The FCCA notes that this year, 13 destinations throughout the Caribbean and Latin American region participated in the competition. The FCCA judged the entries to select winners based on their creativity and messages advocating the role each destination plays in preserving the environment. Prisca Charles captured the theme: “Our Environment Is In Your Hands.” She also won an educational scholarship of $3,000. Parents and teachers attended the event.